Being stateless ultimately means having no nationality, and having no nationality usually means having no documents to prove one’s identity. People can become stateless for many reasons, two of which are conflict and forced displacement. Conflict not only impacts stateless people the most heavily in their ability to flee, but it also actively contributes to the creation of statelessness. It is this point that we will explore further in regards to the case of Syria. Syria has been caught in the midst of civil war since 2011, resulting in the mass exodus of its citizens. Over 5 million Syrian refugees have been registered in neighbouring countries and over 1 million have travelled to Europe. Whilst the majority of these refugees hold Syrian nationality, there are a number who exist as stateless. It is these individuals who are most at risk of exposure to human rights abuses with no recourse to justice when attempting to rebuild their life abroad. At the end of 2015, UNHCR, the UN Refugee Agency, estimated that there were 160,000 stateless persons in Syria. Fleeing war as a stateless person often results in significant difficulty for registering as a refugee once within a host nation, as there are no documents to support the claim for asylum. This leaves individuals at higher risk of authorities rendering their case inadequate or fabricated. In 2015, 108 stateless people were detained in Britain, without clear understanding of where these individuals could be deported to. The UK is the only nation in the European region with no set time limit on detention. This leads to concerns regarding the right to liberty, as well the multiple interpretations of this right within regional and national legislation. Existing statelessness is not the only way this issue manifests itself among the populations of Syria fleeing war. There are a growing number of Syrian children born abroad after their parents have fled the situation of conflict; UNHCR estimates that 70% of these children are not registered at birth. 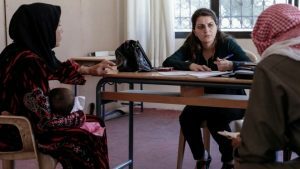 This significantly heightens the risk of statelessness among these children and narrows their future potential to prove their Syrian nationality. There are a number of factors which impede the potential for Syrian refugees to register a birth in host countries. One of the key barriers is a lack of documentation needed to complete the registration. Many Syrians have lost or had their documents destroyed before or during their journey to reach refuge. Additionally, non-state actors have begun issuing documentation in Syria, and the validity of these as legitimate identification is widely disputed. This issue is exacerbated by gender discrimination within Syrian nationality law. Whilst Syrian fathers can pass Syrian nationality to their children when born outside of Syria, Syrian mothers cannot. It is therefore necessary to document the connection to a Syrian father, but where there are difficulties with this – particularly within female-headed households – children are at particular risk of statelessness. Whilst there are these systemic barriers to registering a birth, there are also considerable social barriers. Refugees are at a significant disadvantage in their ability to navigate the civil registration process in host countries, which may differ from their own perception of what is required to register a birth. Additionally, there may then be prohibitive costs and language barriers which further prevent the practice of ensuring that births are registered. In 1954, the UN recognised the international obligation to end statelessness in the Convention relating to the Status of Stateless Persons. We are 63 years on from this point. There are still 10 million stateless people worldwide and 600,000 in Europe. Without the necessary papers, people are denied their basic rights, including access to education, employment, housing, healthcare and – ultimately in the case of Syria – a secure safe haven which could provide the potential to rebuild lives affected by war and conflict. In 2014, the UN launched a global campaign to end statelessness by 2024. If we are to prevent this campaign from having as little effect as the 1954 convention, it is essential that organisations and state departments engaged in refugee responses understand the heightened risks for stateless people who are displaced from Syria as well as the creation of further statelessness, especially where national frameworks do not currently meet culturally diverse needs. With improved information on how statelessness interacts with their work, refugee practitioners will be able to frame their programmes and policies appropriately to mitigate these risks. Albarazi, Z and Van Waas, L (2016) Understanding Statelessness in the Syria Refugee Context. [Online] Oslo, Norwegian Refugee Council. Available from: <http://www.syrianationality.org/pdf/report.pdf> [Accessed 10th April 2017]. European Network on Statelessness (2016) Detained and nowhere to go – new report sheds light on hidden misery of Britain’s stateless people. [Online] London, European Network on Statelessness. Available from: <http://www.statelessness.eu/sites/www.statelessness.eu/files/ENS-Press_release-Detention-UK-10-Nov-2016.pdf> [Accessed 20th April 2017]. European University Institute (2016) Syrian Refugees: A snapshot of the crisis – In the Middle East and Europe. [Online] Fiesole, European University Institute Migration Policy Centre. Available from: <http://syrianrefugees.eu/> [Accessed 20th April 2017]. Gentleman, A (2014) UN refugee agency launches global campaign to end statelessness. The Guardian. [Online] 4 November. Available from: <https://www.theguardian.com/world/2014/nov/04/un-refugee-agency-global-campaign-statelessness> [Accessed 20th April 2017]. UNHCR (i) (2014) UNHCR announces push to end statelessness worldwide by end-2024. [Online] Geneva, UNHCR. Available from: <http://www.unhcr.org/ceu/492-ennews2014unhcr-announces-push-to-end-statelessness-worldwide-by-end-2024-html.html> [Accessed 20th April 2017]. UNHCR (ii) (2014) UNHCR launches 10-year global campaign to end statelessness. [Online] Geneva, UNHCR. Available from: <http://www.unhcr.org/uk/news/latest/2014/11/545797f06/unhcr-launches-10-year-global-campaign-end-statelessness.html> [Accessed 20th April 2017]. UNHCR (2015) Global Trends: Forced Displacement in 2015. [Online] Geneva, UNHCR. Available from: <http://www.unhcr.org/576408cd7.pdf> [Accessed 20th April 2017]. UNHCR (2017) Syrian Regional Refugee Response: Inter-Agency Information Sharing Portal. [Online] Geneva, UNHCR. Available from: <http://data.unhcr.org/syrianrefugees/regional.php> [Accessed 20th April 2017]. *Dilys Hartley is a student currently studying Understanding and Securing Human Rights with the School of Advanced Study, University of London, with a particular interest in securing human rights for minority groups and a focus on refugee and migrant populations. This entry was posted in Nationality, Refugees, War and tagged nationality, Refugees, war. Bookmark the permalink.